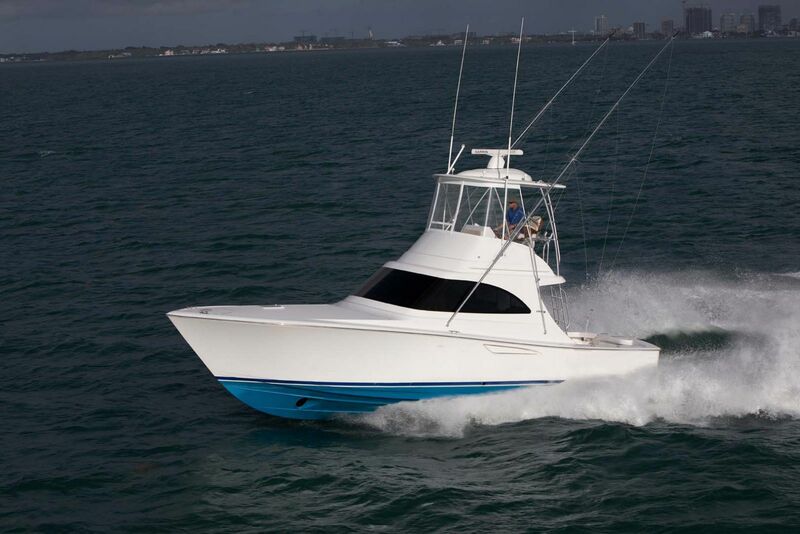 The Viking Yachts 92 Enclosed Bridge is the bluewater sportfish that serious tournament anglers dream of owning. 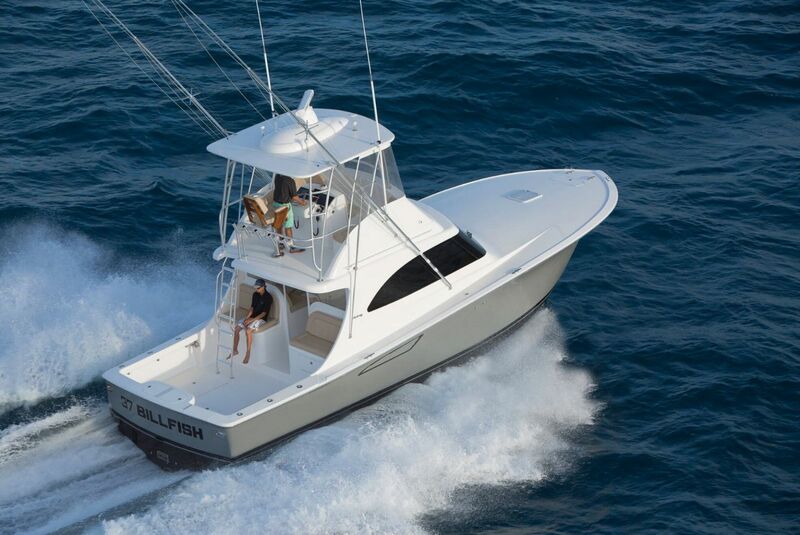 The Viking 92’s that are on the water today are iconic, winning major tournaments like the Bahamas Billfish Championship and Bermuda Triple Crown. 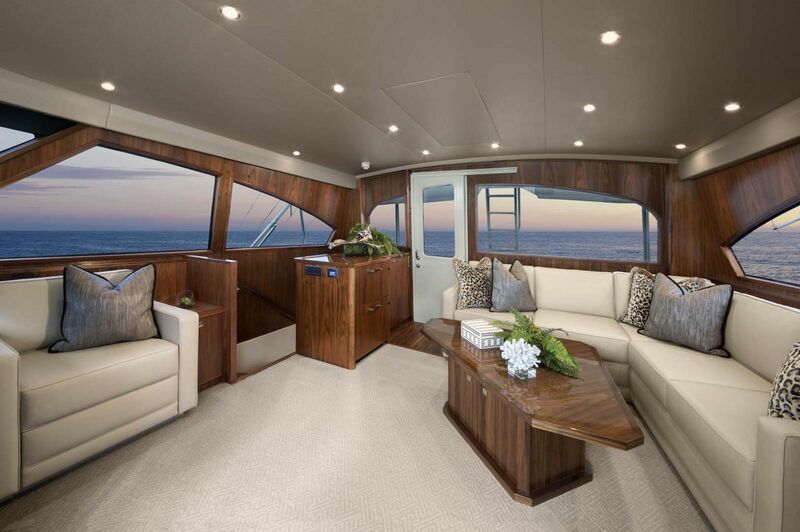 As the flagship model for the world’s most esteemed yacht builder, the 92EB leaves nothing to want. 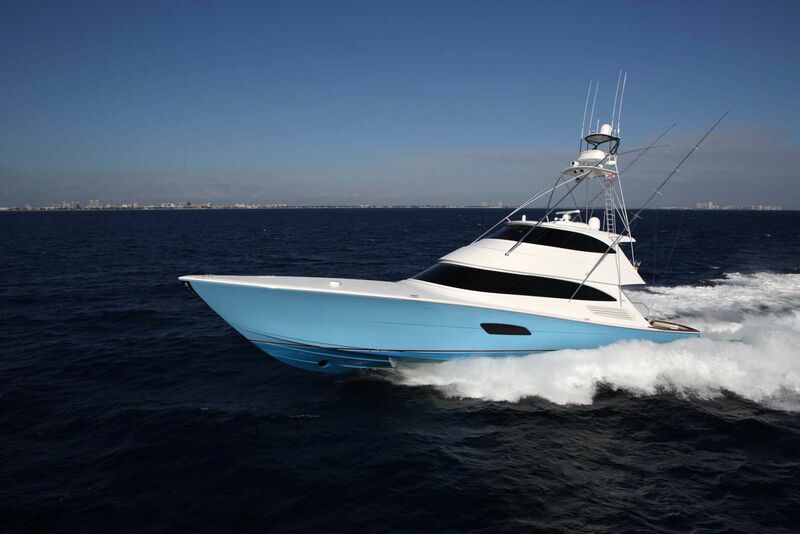 This amazing achievement combines all of Vikings ingenuity, technical skill, design prowess, and gritty effort into one of the most spectacular sportfishing and cruising yachts ever to see the ocean. 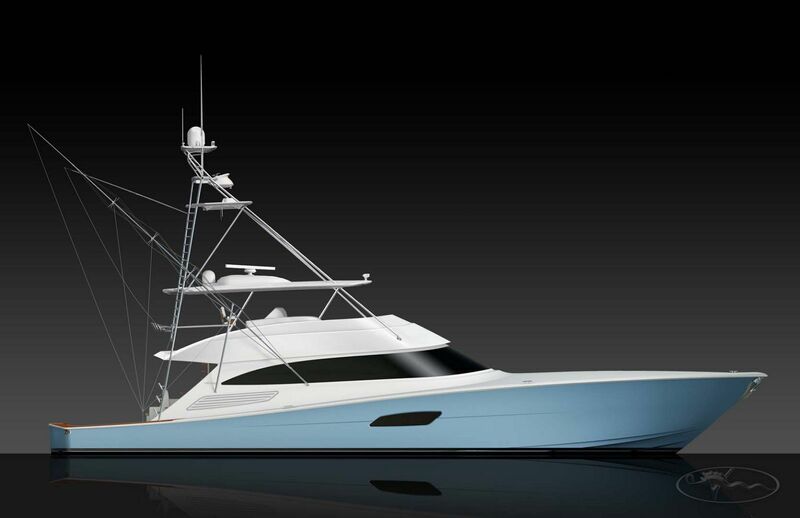 The profile of the Viking 92EB is powerful, yet mesmerizing, especially when throttled down. 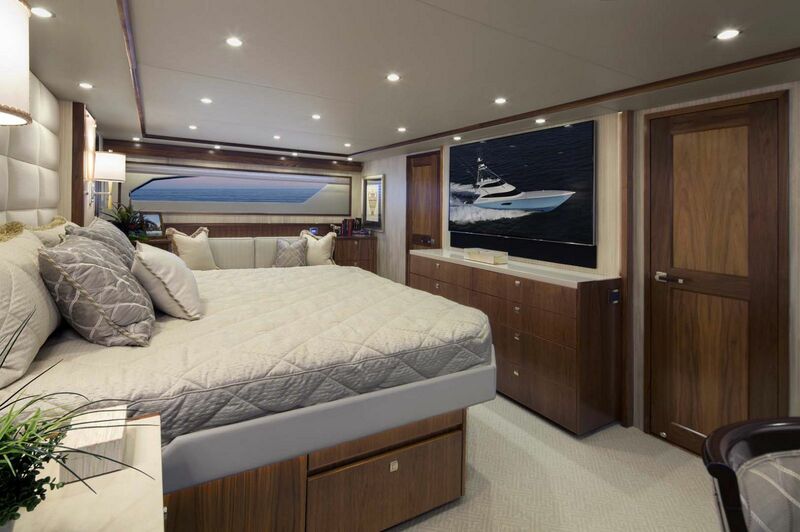 While she is a tournament sportfisher at heart, the 92 several cues from the motor yacht industry that add to the comfort level on board. 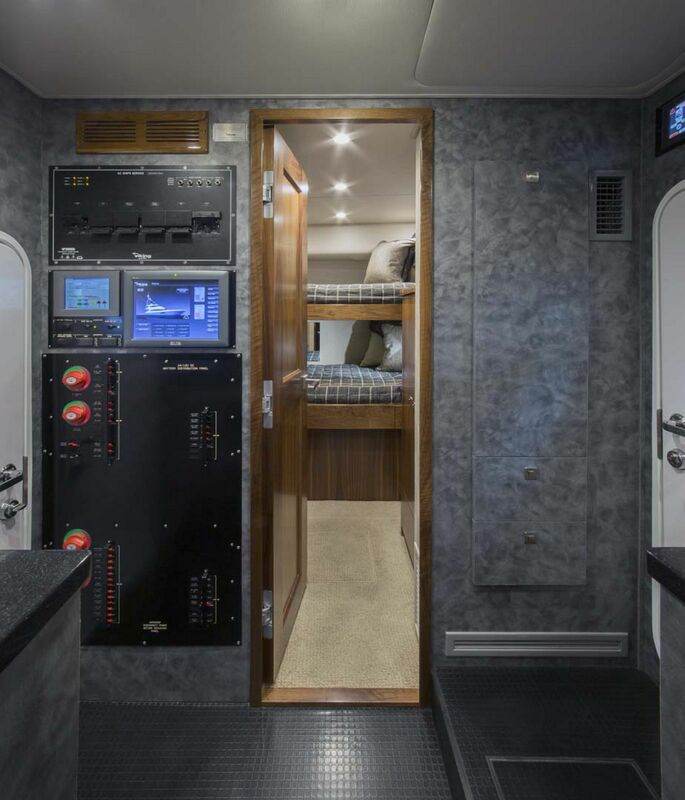 As any of the current 92 owners can attest, being a captain of “The Titan” pushes you to travel farther and fish longer. 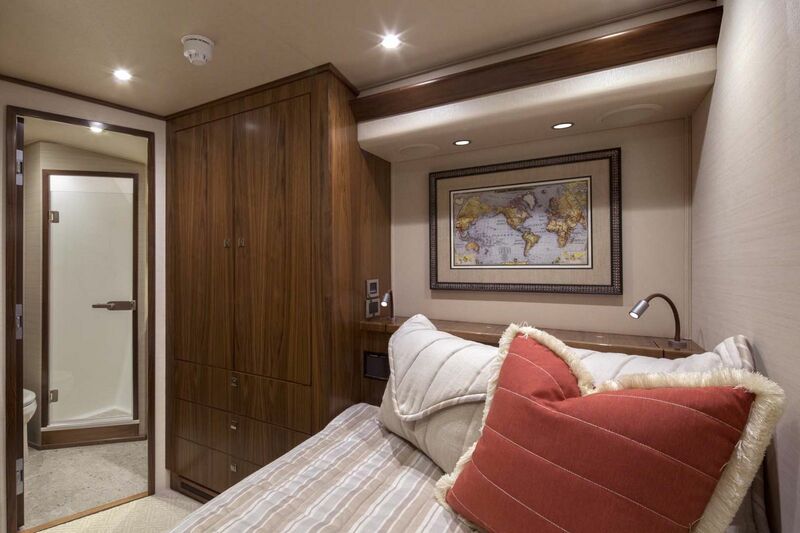 And as new fishing grounds await your discovery, it’s important to have the comfort features of home for guests and crew alike. 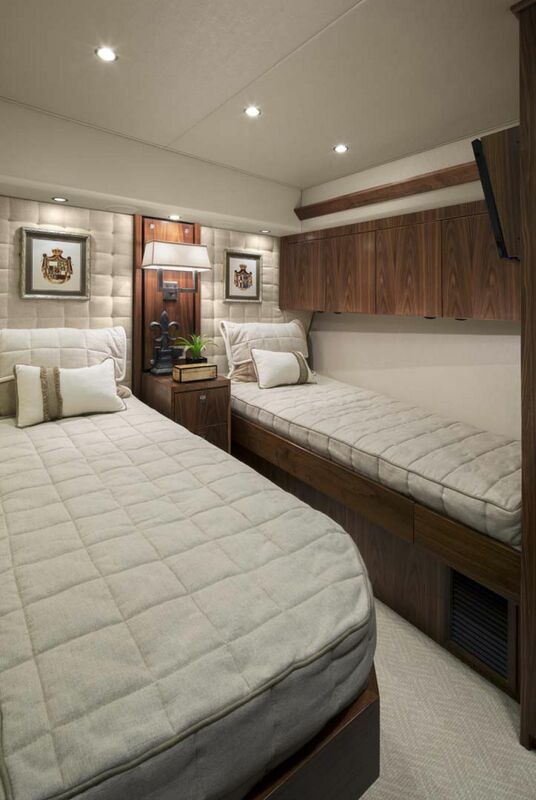 One example is Viking’s addition of dual mezzanines aboard the 92EB, both of which sport rear facing lounge seating with tables for outside dining. 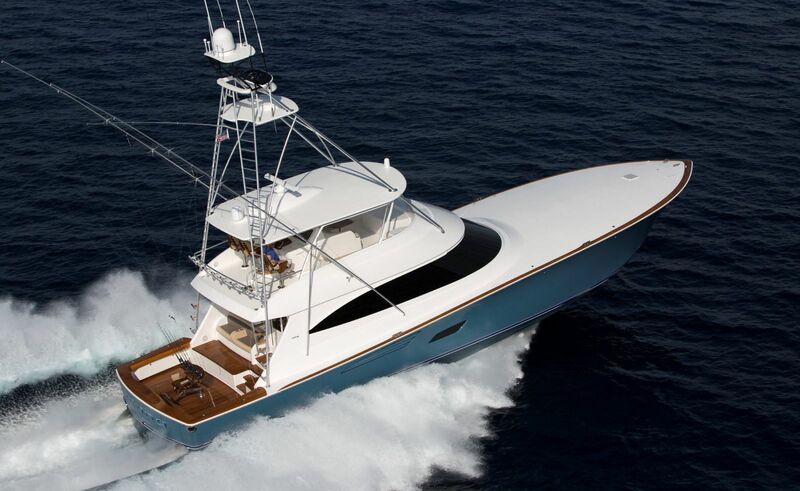 Ever watch someone fight a 1,000lbs marlin while enjoying a cocktail and a sandwich in the air-conditioning? 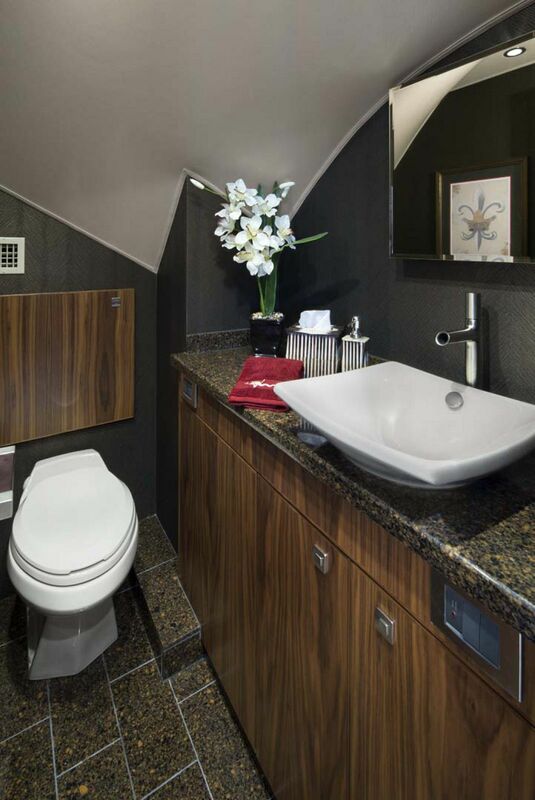 Viking’s observation mezzanines are akin to the most expensive suites at any of today’s NFL stadiums, an experience to watch the action like no other. 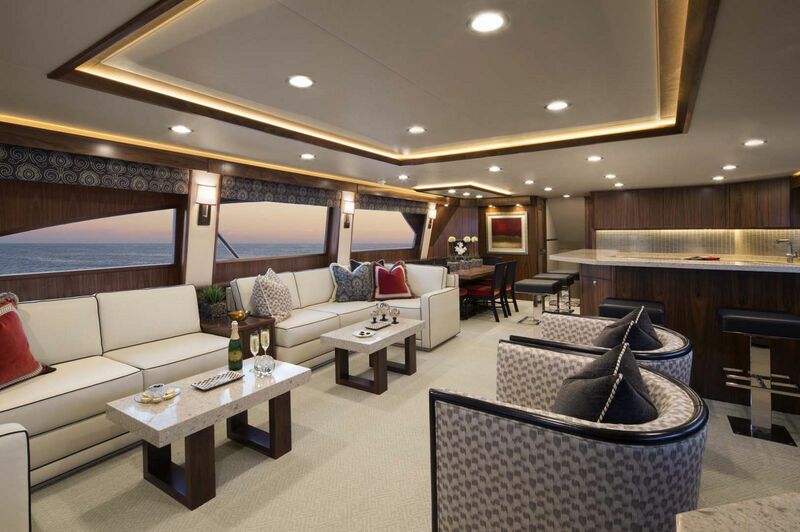 At 92-feet and with a beam of 23-feet, there is ample space aboard to do some amazing things. 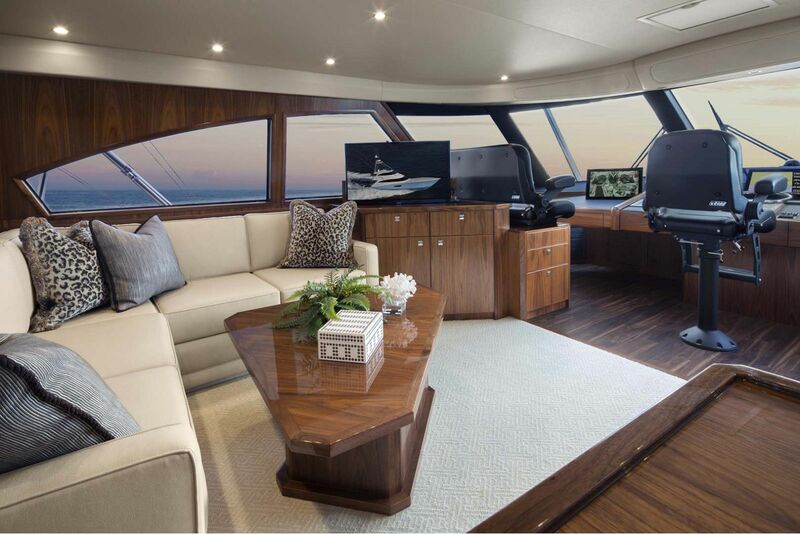 The salon of the Viking 92 is like a luxurious living room with high-end appointments like built-in furniture and a 60-inch flatscreen that disappears inside teak cabinetry when not in use. 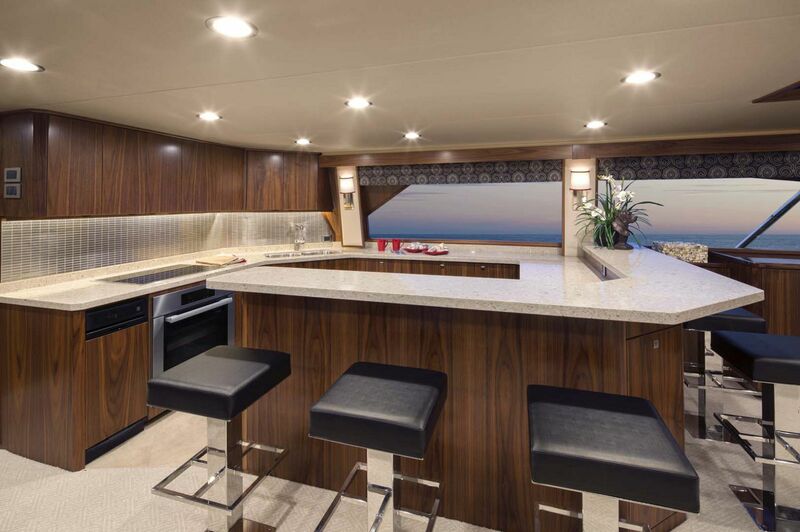 The galley is massive and looks incredible with granite countertops, walnut cabinetry, and leather-topped barstools. 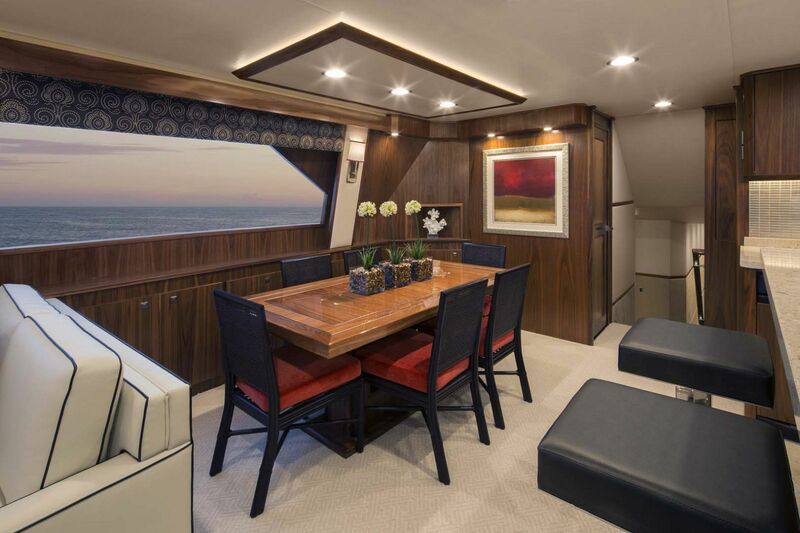 The dinette is room for six people around it and the flush-mounted lights can be dimmed to set any mood. 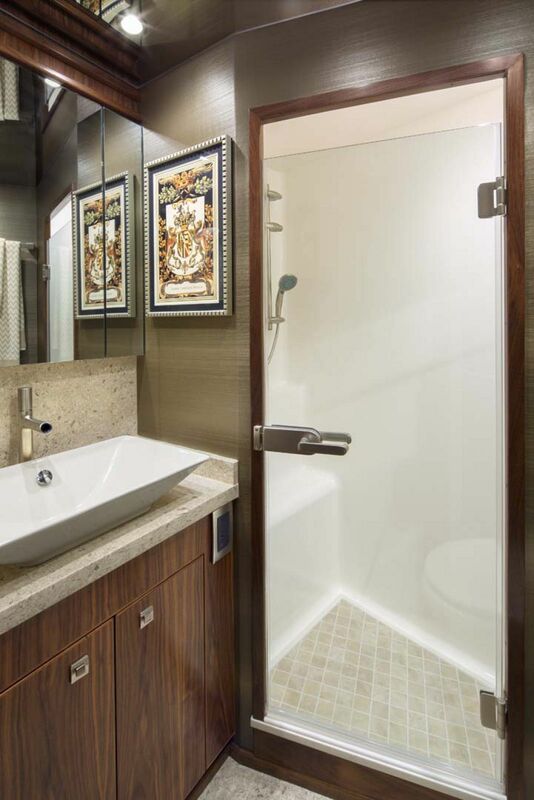 The walk-in pantry adjacent to the galley is so large, it can even double as a stateroom. 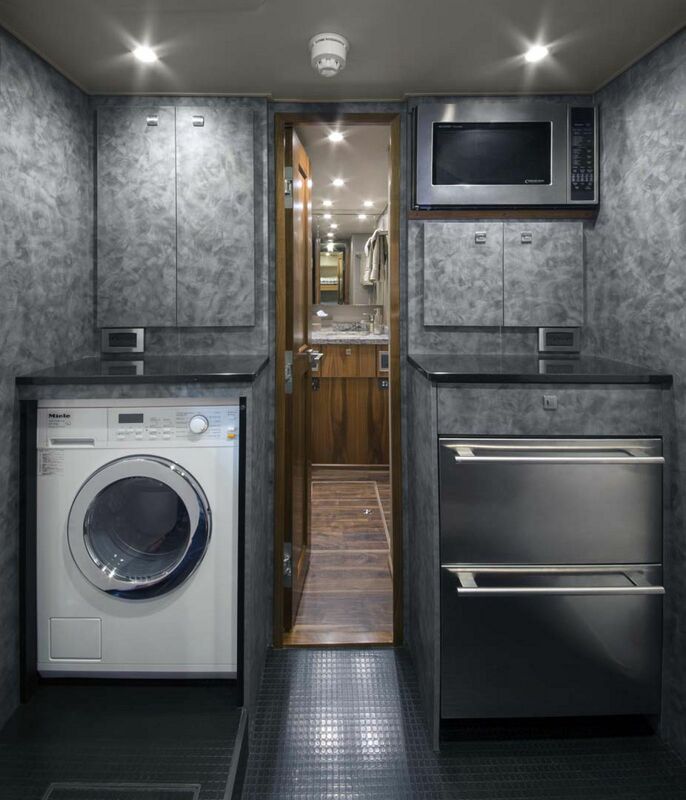 The amount of storage space and refrigeration lets owners take extended trips offshore without worrying about running out of supplies. 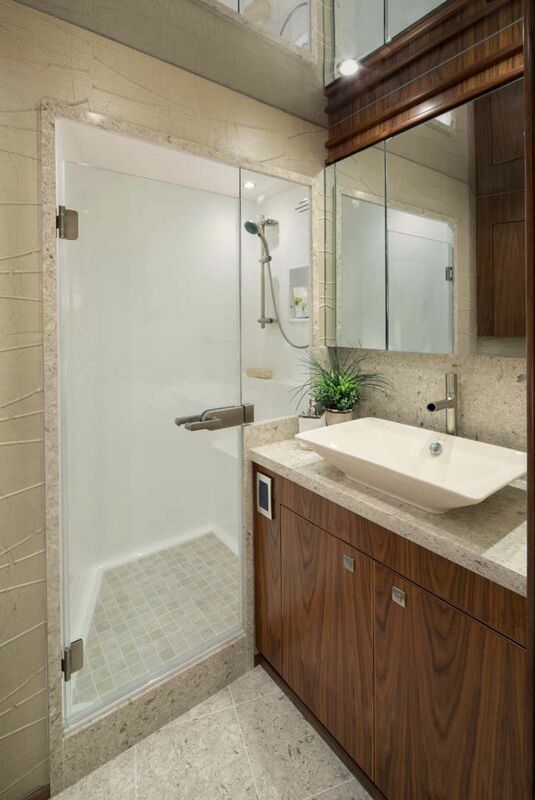 The six state-room layout provides plenty of privacy for all guests as each has its own private head and shower. 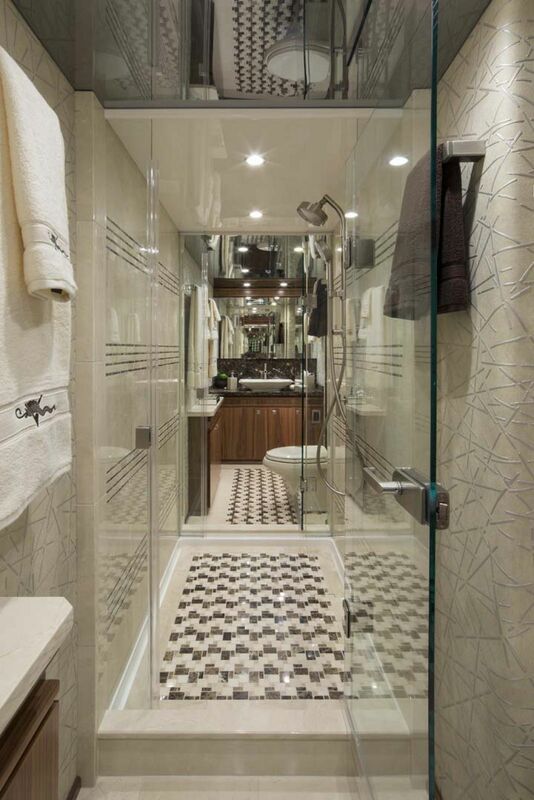 With a water capacity of 485 gallons, no one on board is running out of water anytime soon. 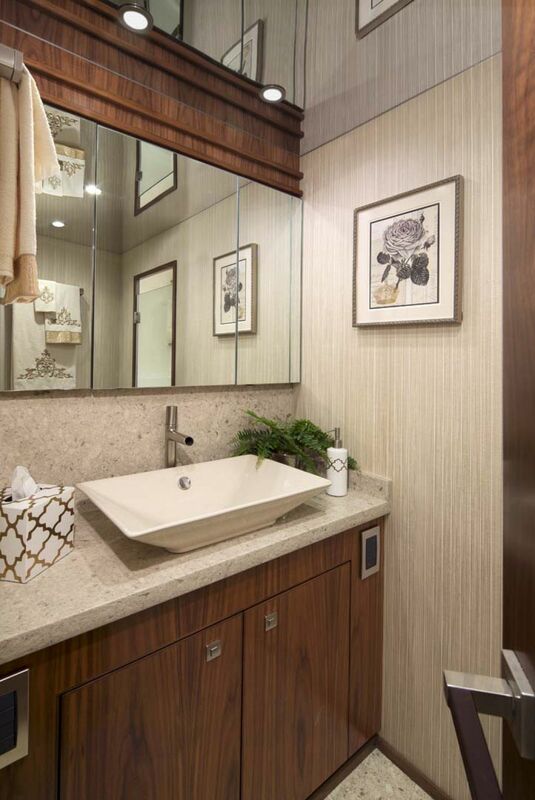 The master suite stretches the full beam of the boat and has a king-sized walk-around berth with walk-in closet and his and hers private bathrooms. 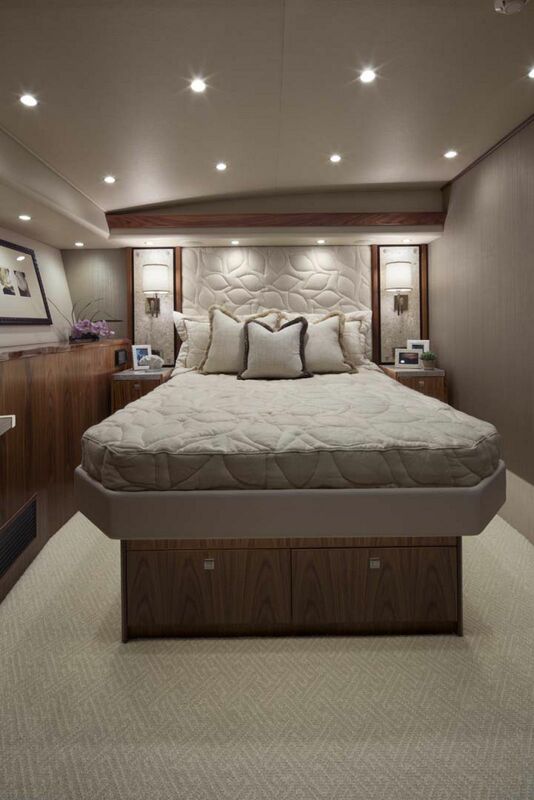 In true Viking fashion, the 92 Enclosed Bridge was equipped with the very best power options available. The standard engine package features the Caterpillar C32 1925hp engines. 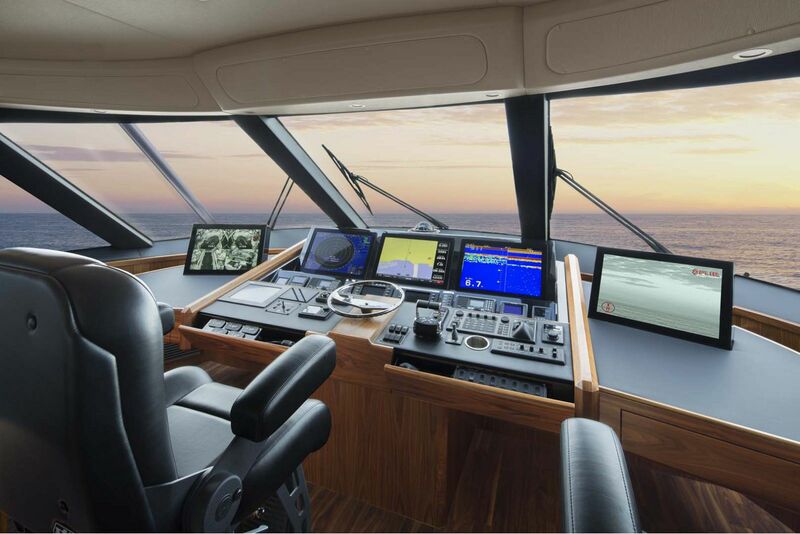 But when owners opt for the MTU Series 2000 V16 M96L 2635hp engines, magic happens. 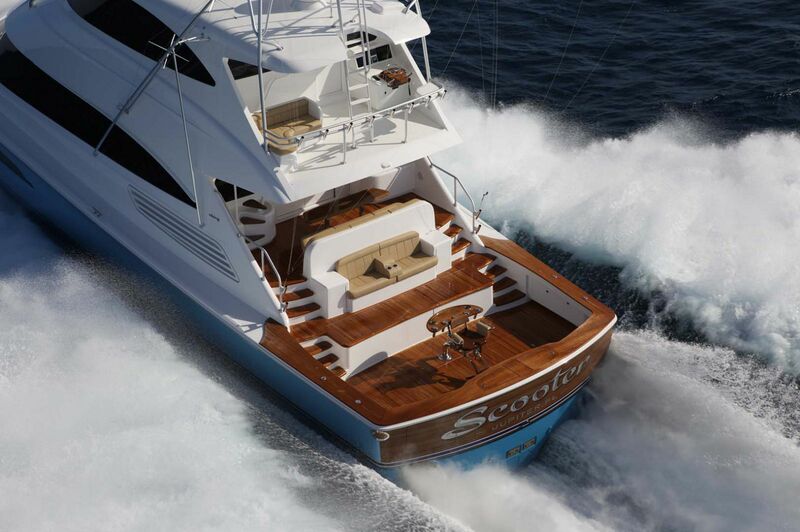 Each engine has three turbochargers that help to push all 200,000-plus pounds from idle speed to over 30 knots in fourteen seconds. 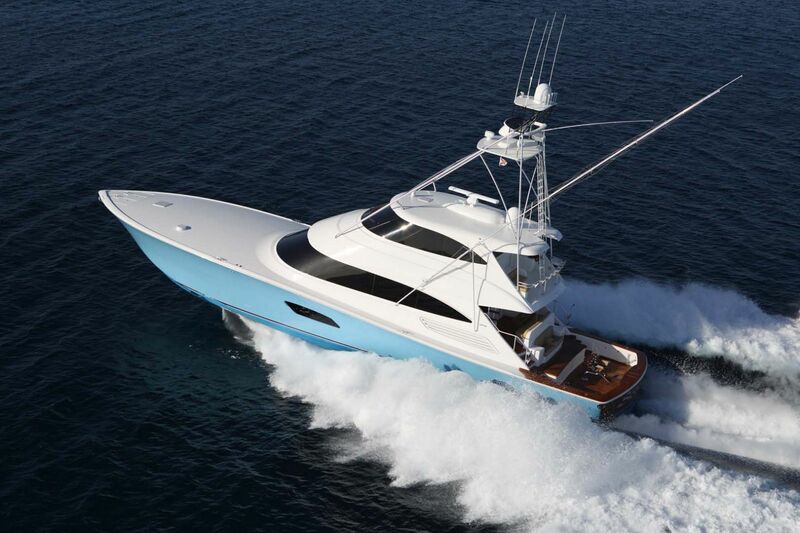 With a top end speed of 36 knots, the Viking 92 can look like a freight-train to smaller vessels trying to navigate around its wake. 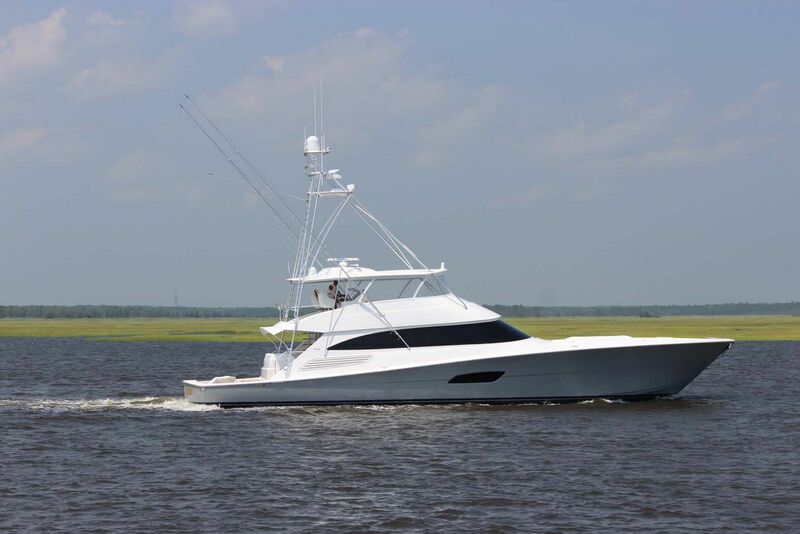 Contact your Staten Island Yacht Sales Professional today for more information on either the convertible model or enclosed bridge version of the Viking Yachts 92. Helpful articles, videos, and boat tests to help your research. 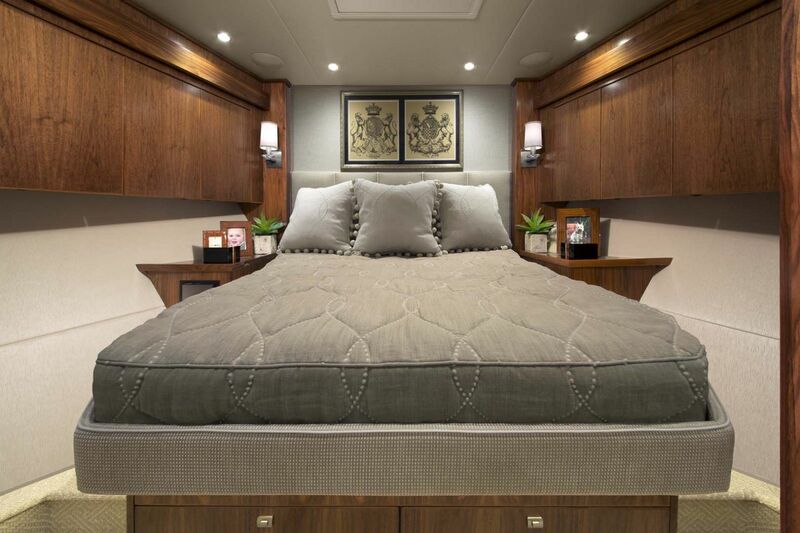 Gary Caputi reviews the Viking 92's interior and construction. "Here I was in Atlantic City, New Jersey, to test Hull No. 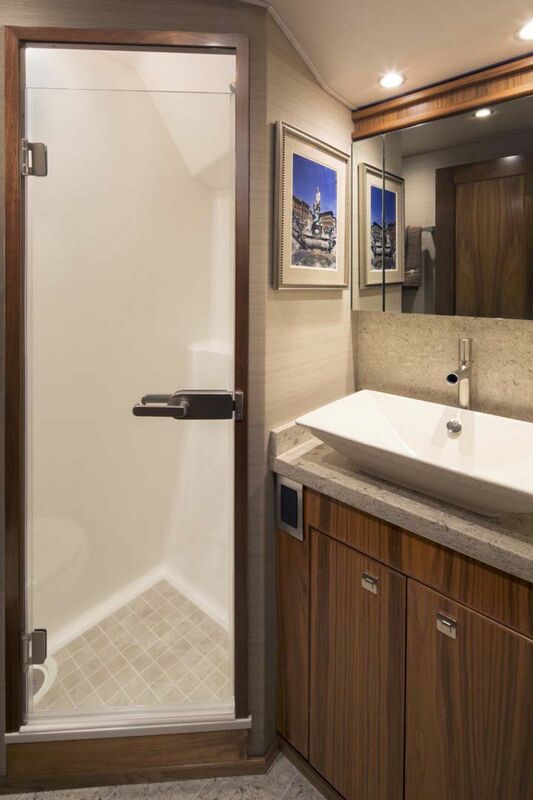 1 of the Viking 92C..."
Yachting Magazine "Introducing The Titan"
A great photo gallery and review by Yachting Magazine of the Viking 92 Convertible. 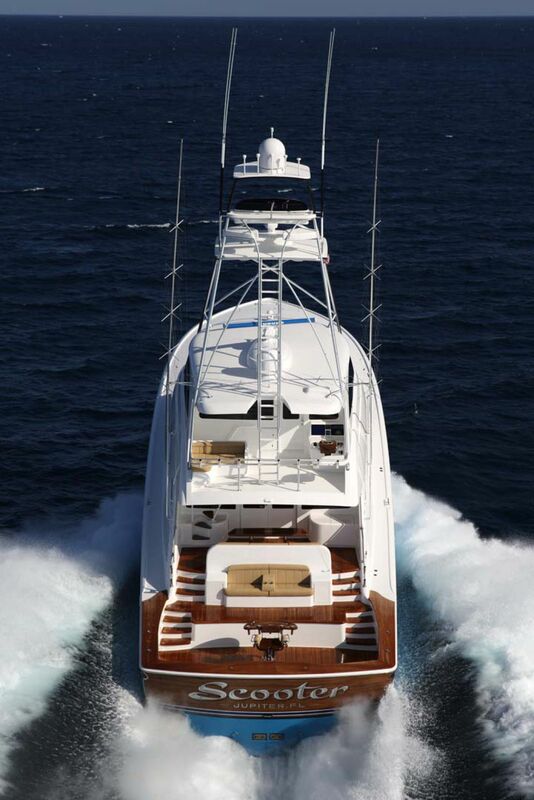 The Viking 92 Fa-La-Me tags a Blue Marlin.